Counting may seem as easy as one-two-three to us, but it’s a tricky skill for your child to learn. We explain the stages of getting to grips with number in Reception and Year 1. As adults, we can think of few things easier than counting to 10. But mastering what we see as very basic number skills is a tough learning journey for your child. ‘Learning about number and counting is really quite complex and involves language, working memory, visualisation and more,’ agrees Margaret Haseler, primary lead consultant for National Numeracy. So how does your child get to grips with number in the early years? Just as babies are born with some innate understanding of language, they also have the ability to appreciate quantity. ‘They can’t articulate it, but they can tell when a quantity in front of them has changed,’ explains Margaret. The neuropsychologist Brian Butterworth claims that this is because we are all born with a ‘number module’ in the brain which means we’re naturally attuned to quantity. The first obvious stage of learning about number is, for most children, learning number names. ‘This usually happens from around the age of two and a half, when children start to repeat the names of numbers that they hear people saying,’ says Margaret. At this stage, though, they don’t connect the names with a quantity, or understand that they come in a fixed order. What you can do: Sing number songs like One, two, three, four, five, once I caught a fish alive, read books that involve numbers, point out number in the environment and talk to your child about numbers. The next stage is for children to learn that numbers have a fixed, unbreakable order: one, two, three, four, five and so on. ‘This is a complex skill to master: they have to know the number names and then master the sequence and get them in the right order, which involves a huge amount of working memory,’ Margaret explains. To make matters harder, they need to count as far as the twenties before they hear a repeating pattern. What you can do: Count things out in front of your child: ‘Let’s put one, two, three pieces of apple in your bowl.’ Use everyday opportunities to practise counting, for example, counting the stairs as you go up. From there, children learn about one-to-one correspondence. ‘This involves counting a group of objects by matching a number name to each one, and requires hand-eye coordination as well as number skills,’ Margaret says. Children usually do this by physically pointing at or touching each object in turn, and the skill tends to develop from around the age of three and a half. It’s common for them to make mistakes, such as missing out a number or saying a number twice. Later, they begin to understand that they can count things that they can’t physically point to, such as the days of the week or the rooms in their house: the abstraction principle. They also begin to learn that it doesn’t matter in which order they count the group in; the number stays the same, whether they start from the left, right, top or bottom. This is called the order irrelevance principle. What you can do: Provide objects for your child to count, like plastic dinosaurs or beads to thread onto a string. Encourage them to match numbers: for example, you could draw a picture of a ladybird with three spots on one side, and ask them to draw the same number on the other side. What you can do: Encourage children to estimate how many objects are in a group. Use different representations of number, such as dice patterns, to make estimating easier. In addition, there is nothing about the digit 5 that physically represents five, so children will learn other ways to visualise the number – such as picturing five spots on a dice, or five fingers on their hand. What you can do: Talk to children about the different uses of numbers. Notice and discuss numbers in the environment, for example, ‘Look, there are four birds on the fence,’ or, ‘Can you see the number four on that door?’ Play games and talk about the numbers on the dice: children who play board games with their family have a better understanding of number before school age. By the end of Reception, most children have mastered all the above stages, and are also learning about concepts like counting backwards, counting in sequence starting from a number other than one, and the ideas of fewer than, more than, higher than and lower than. ‘This is quite a complex stage as it relies on a knowledge of the language of maths, and parents often overlook this and focus all their attention on just counting,’ Margaret explains. Help your child practise their skills and keep them engaged with early maths with these great tools. 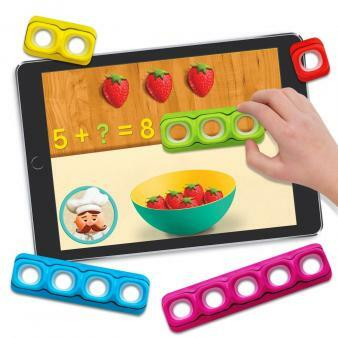 Magnetic counting toys for iPads and Android tablets, Tiggly Maths works with your device to make numbers and early addition concepts come to life. Our four-year-old tester loved the interactive number line, matching and equal-sets activities and the tactile, colourful counters (they come in their own cloth storage bag, a definite plus for tidying-up time). Three free early maths games are available to use the counters with: Tiggly Adventure, Tiggly Cardtoons and Tiggy Chef. You can also use number lines to help your child visualise and work with numbers. Download a selection of free number lines and number ladders from TheSchoolRun, or download and decorate your own. A classic kids' television character, the Count from Sesame Street was obsessed with numbers. Watch the Count's videos and play his number games on the Sesame Street site for effective, timeless educational programming that's perfect for Reception-age children. What are cardinal and ordinal numbers?